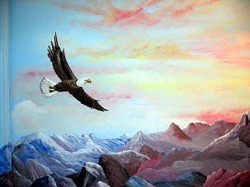 Click on photo or link to see more photos of each mural. My friend owns a beauty shop and we bartered for services. I turned her bathroom into a mountain top place of inspiration. While sitting on "the throne", the patrons could imagine they were on top of a mountain, with views of waterfalls, lakes, and wildlife. 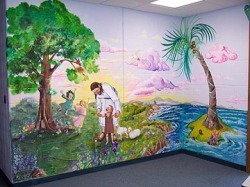 This was a mural of Jesus playing with the children that I did for our church nursery. They have since painted over it, because the secretary turned the room into an office and didn't think the mural went with the office decor. So the pictures are the only memory if it. More photos of the nursery room. 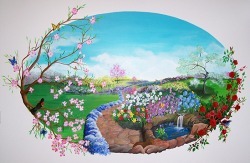 Garden mural on one wall. 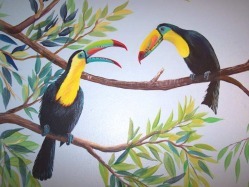 This was in the sun room next to the indoor spa of the spa mural I also did. All the walls were painted white, so this helped add interest to an otherwise all white room. A jungle adventure was the theme for this children's bedroom. Click here for more details of this room. 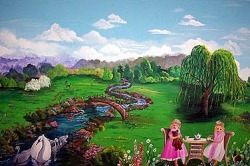 I was commissioned to paint a meadow scene on one wall of a doctor's twin girls' playroom. 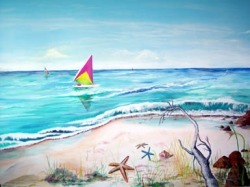 They were only about two years old at the time I painted it. You can see them having a tea party with their teddy bears.